About: Harvester - home of the flame-grill and the help-yourself salad cart - offer a relaxing farmhouse atmosphere and fresh, wholesome food. The menu includes succulent spitroast chicken, the wholesome taste of flame-grilled steaks, platters with a little bit of everything and unlimited freshly prepared salad with every main meal. 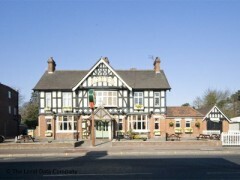 this is a fantastic pub and i spent my last night before joining the army at this venue. We had an excellent evening, a real good send off. Highly recommended.